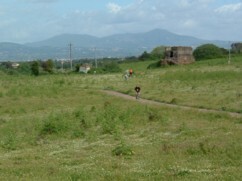 The Valley of the Caffarella is part of the archaeological park of the Appian Way (Parco Regionale dell'Appia Antica), and is a stretch of countryside within the city, dotted with ruins. A truly unique spot with a strange and sometimes spooky atmosphere, the Valley of the Caffarella is a timeless stretch of land which borders the built-up areas of southern Rome, cutting right into the modern city between the Via Appia Antica and Via Latina. It follows the course of the small river Almone through a green and hilly landscape. It is a protected public park, and is home to many species of birds and animals which have vanished from much of the remaining Roman countryside. There is a wild feeling about the terrain, parts of which are still used for agricultural purposes, and you may encounter flocks of sheep, guarded by shaggy white dogs. The Caffarella is not just interesting for its wildlife and its fresh countryside air, however. The area between two ancient Roman roads is dotted with archaeological sites. 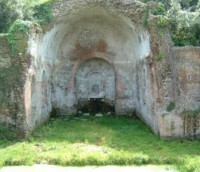 Myths and legends abound here; the remains of a sacred woodland, a grotto where the nymph Egeria dwelt, venerated springs. The home of the nymph, an imposing nymphaeum (Ninfeo di Egeria), is one of the best preserved and most visible ruins - the path passes right in front of it, and it's a thrill for the visitor to see a site like this just sitting in the countryside with no-one around. There were many prestigious Roman tombs and villas in this area just outside the city walls, and a few of these, adapted for later use, are also well-preserved. Other buildings have eroded into massive stumps of wall sticking out of the grassy landscape. 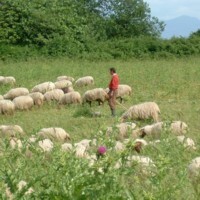 As well as sheep, you are most likely to encounter health-conscious Romans jogging or cycling around the winding paths in the valley bottom, or up the slopes from which, on a clear day, you can see the hills around Rome, capped with snow in winter. One of the most intriguing sites in the park is the Casale della Vaccareccia, a farm complex which appears to have had bits added, and other bits left to rot, since time began. 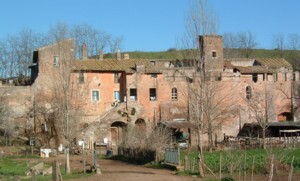 The sprawling building has battlemented walls, an abandoned tower, gaping window frames, but is obviously inhabited: you may see boys feeding chickens in the dirt or grandmother hanging out washing. To combine the park in an itinerary with the Via Appia Antica: alight from the bus (218 from San Giovanni or 118 from Piramide) at the start of the Via Appia Antica, at the first or second stop outside the Aurelian Wall and Porta San Sebastiano. On your right there is a Visitor Centre where you can pick up maps and leaflets about the area, and even hire bicycles. Follow the road around to the left, past the church of Domine Quo Vadis (where you can see Jesus's footprints preserved in marble). When the road bends back to the right, take the little lane on the left (there is a useful map on a large board here) and follow it past tennis courts and gardens until you come to the gateway of the park. After you have wandered the length of the park, leave by one of the Via Appia Pignatelli exits up on the slopes by the church of S. Urbano. You can catch a bus here to return into Rome, otherwise turn left and cross the road. Looking through the bushes you get a good view of the Circus of Maxentius (the entrance is on the Appia Antica). Taking the next turning on the right will take you up onto the Appia Antica, by a bar where you can get refreshments. From here you can choose to return towards Rome, via the catacombs and the Tomb of Cecilia Metella, or walking further out along the wilder section of the Appian Way.